February vacation week for schools in Massachusetts is February 18 – 22, 2019. If you’re looking for hands-on, interactive fun experiences to share with the kids during the school break, check out the wild times New England Wildlife Center (NEWC) has planned! The February vacation week STEM educational events are for all ages! Participants young and old will learn more about local wildlife, habitats, and our natural environment. All February Vacation Week events are free for members. Plus you’ll receive a special invitation to Please Do Feed the Animals, a members-only event on February 16. Attendees will help prepare and deliver diets to the educational animals at the Center. Educational events are free for members and $8/person for non-members and include admission to the wildlife center. NOTE: ALL CHILDREN UNDER 14 MUST BE ACCOMPANIED BY A PARENT OR GUARDIAN. New England Wildlife Center’s Weezie Nature Center surrounds you with the sights, sounds, biology, and natural history of Massachusetts. Walk NEWC’s indoor nature trail with education coordinator/nature guide Erica Burrows who will introduce you to resident animals and highlight the science happening in local habitats. Take a closer view with microscopes and explore the inside of an authentic Araquon lodge, too! Special snacks, daily activities, and hands on science and art add to the warm relaxed fun. Explore NEWC’s wildlife hospital and The Odd Pet Vet ward with Dr. Greg Mertz, NEWC board chair and chief medical and program officer. Ask any and every question about animals and nature you can think of – Dr. Mertz is like a walking encyclopedia! Learn something new and come experience nature close to home! 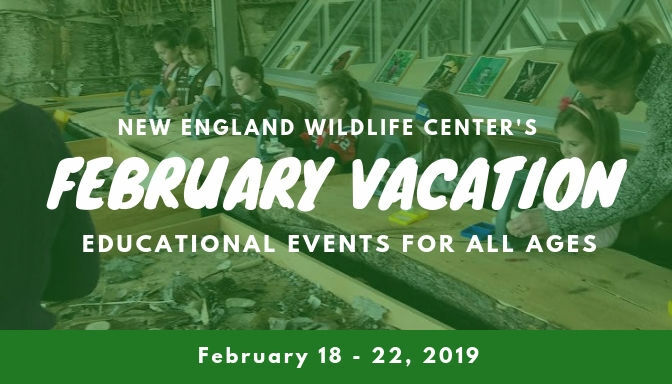 For more information about the February Vacation Week events, contact Erica Burrows at 781.682.4878 x123 or erica.burrows@newildlife.org.